Successful American sculptress Jess (Katee Sackhoff) returns to the U.K. where she once lived and had a troubled past involving drugs. Now happily married to a banker with more money then they really need, she aims to make her life complete by rebuilding her relationship with daughter Chloe (Lucy Boynton) who she was forced to give up years ago. Naturally things don't go to plan and Chloe refuses to live with her mother, that is until supernatural events persuade her to be with people who can care for her. 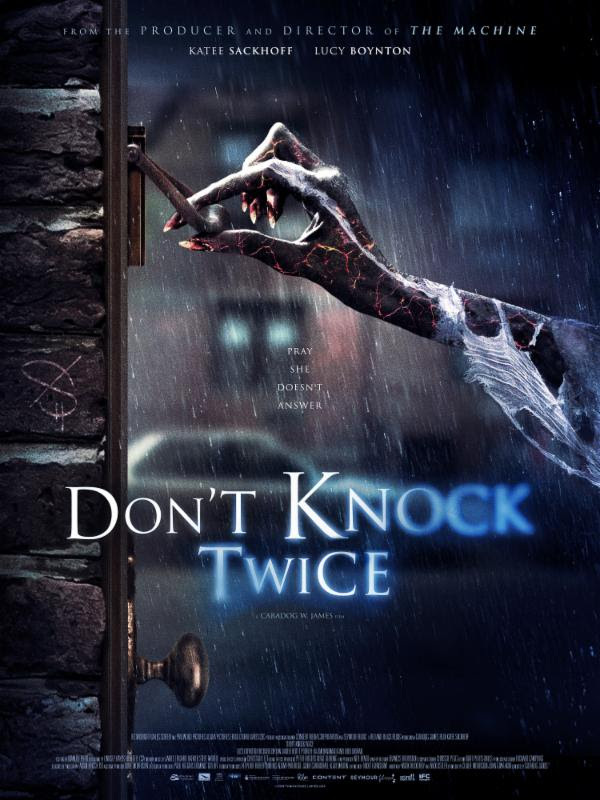 Chloe's boyfriend Danny has gone missing after they dared to knock twice on an abandoned house that many believe to be haunted. The home once belonged to an old lady called Ginger and it is said that if you knock twice on the door her vengeful spirit will come for you. As you would expect Chloe's mother doesn't believe her and puts it down to Chloe's resentment to her mother and child ghost stories. She will soon know the truth though as she is forced to battle with the supernatural force herself that will stop at nothing to claim its victim. Cardog James follows up his 2013 artificial intelligence movie THE MACHINE with this supernatural tale that is just as much a horror film as it is a relationship drama full of modern and old school horror scare tactics. 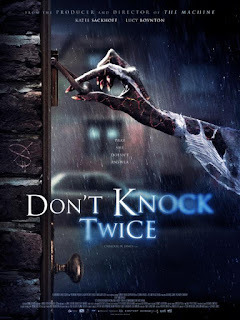 First thought looking at the poster for this film brought to mind the poster art for the 1985 horror comedy HOUSE starring William Katt but this film has more scares then that one. This is mostly down to the use of lighting and making sure you never get to really see the demon, little is more as they say. The story is well written and is high on tensions as well as having a few twists along the way which keep you thinking as to what is really happening. The music works really well throughout and though there is a few jump scare moments they are mild. There is a few influences from other countries horror films most notably Japanese. Is this film original? Well no, but it makes up for its originality in the way the story is played out. Worth watching for a mixed bag of horror elements.